Just thought you would like to know a good bait tip for soft baits. Get your soft bait (I use pilchards) and put them inside a squid tube then thread the hook through the baits 3-4 times to hold them. This perforates the soft bait so its smell seeps out and hopefully attracts the big one. The squid tube makes the bait stay on the hook for a lot longer then usual. While on holiday in Auckland in late June, I tried kite fishing for the first time. I used the 65kg Dropper Rig at Owera and caught my first snapper. It weighed in at 4kg. 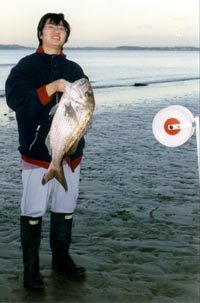 I was very surprised to catch this fish as I was not sure what I was going to catch at Orewa. Kite fishing is a great family activity. Rob at your Paul's Fishing Kites shop was very helpful. On our next trip away the kite will definitely be coming again. I enjoy your newsletters. This is a recent photo on board Raikivi off Cape Turnagain a couple of nice groper, and happy anglers. Well not much to report on this side of the North Island, all we have had is rain and 4 metre easterly swell. Had a report that a couple of keen kite fishers from Central Hawkes Bay made their way over to the west coast to Himatangi last weekend to try their luck as the weather conditions were no good on this coast for kite fishing. I will let you know how they got on next time they drop in. Don't forget our kahawai contest is underway Bring your fish in to Beach Marine to get them weighed them in. If you are in the area and want a chat about the fishing and a cup of coffee, or want to watch the Pauls kitefishing video, feel free to call in at the shop. The project is underway and we have the east Auckland area on site now at http://www.fishingkites.co.nz/areas/aucklandeast.htm. Omaha, Snells Martins Bay and Waiwera already have good information onsite and we need more info for the area from Orewa Beach to Cheltenham Beach. Thank you to those who have offered to help with the project, there is no substitute for local knowledge. If you have any suggestions or additional information please give us a call or send us an email. The Beach Reports have been coming regularly. Thank you to all those who have contributed to the database so far. We are receiving kite fishing reports as well as surfcasting, boat, kayak and kontiki reports. If you have information to add to our database see our Beach Report page to add your data. 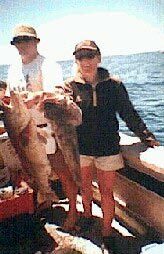 The reports do not have to be recent; if you have information from past fishing trips these can be input as well. Even if you caught nothing on your last fishing trip the information is important as it helps to build a real picture of what is happening at that particular beach. The gurnard are in the Manukau but take a lot of effort to find. My partner Mark went out yesterday with a longline and had to set it seven times to catch 14 gurnard and three kahawai. He used a selection of barracoutta, mullet and kahawai for bait. The good news is the gurnard are BIG. Interestingly the kahawai had been feeding on baby flounder and all had several flounder in their gut, one of which was around four cm long. The article you have been asking for has finally arrived. The Two Hook Pilchard Rig is online at http://www.fishingkites.co.nz/htmfiles/rechooksb.htm. If anyone has been fishing and wants to add further reports to the page, this would be welcome. It would be great if we could get some pics of your catch to post on the page.